1.) We had much-needed rain yesterday! I could almost hear the grass and plants slurping it up as it fell. No watering for me for a day or two. 2.) Between the rain showers, my friend, Bev, and I went beachcombing. We each have a little plastic sand bucket and a long-handled mini-rake. Sometimes we walk side-by-side, seeking treasures and chatting. Other times, one of us will walk up the beach ahead of the other. 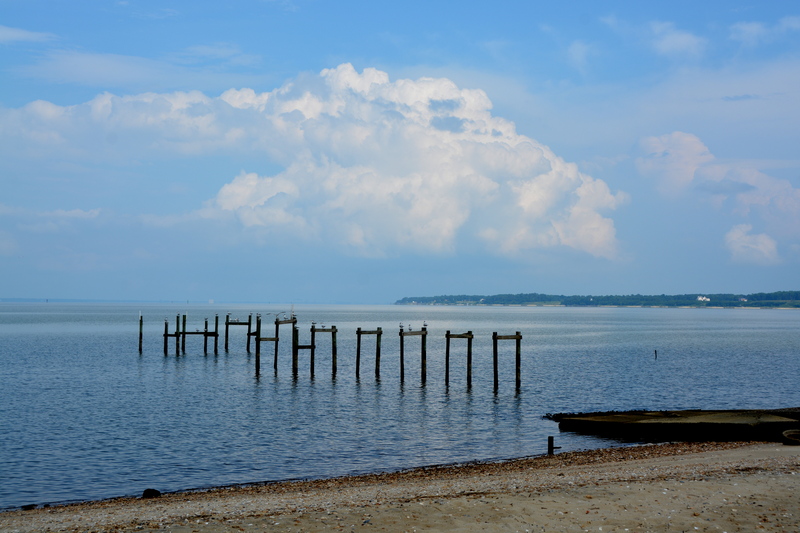 It’s a relaxing time, listening to the waves lap the shore and finding the occasional shard of sea glass or coral. 3.) 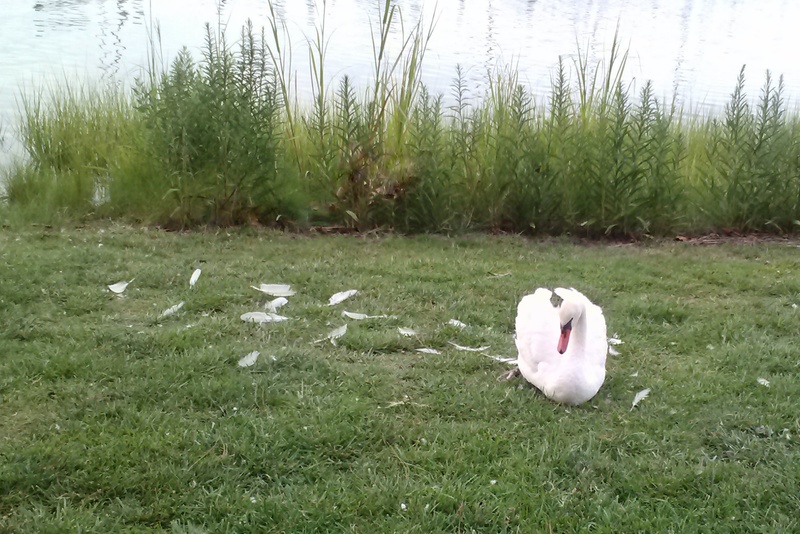 I’m not sure if Bride Swan is moulting or was just a little over-zealous with her preening this week. 4.) Tuesday morning’s sunrise was photo-worthy. Our camera was in the car, so Motor Man went to get it AND took this picture. What a guy. 5.) He and I are once again hosting my family reunion next Saturday. So begins the frequent checking of the extended weather guess forecast. 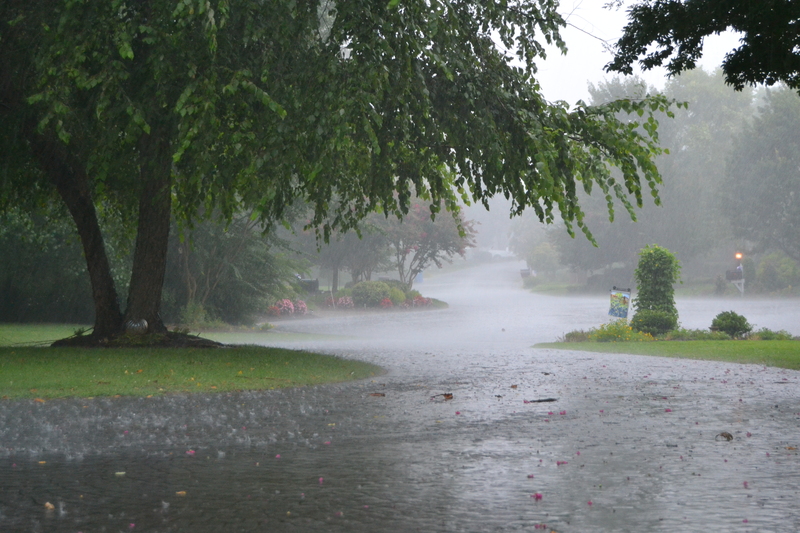 This morning, the Weather Channel’s forecast for August 2 shows….. rain. 90%. Not “a chance of showers” or “isolated showers”, but rain. I certainly am hoping we don’t have a rerun of last year’s reunion day weather. 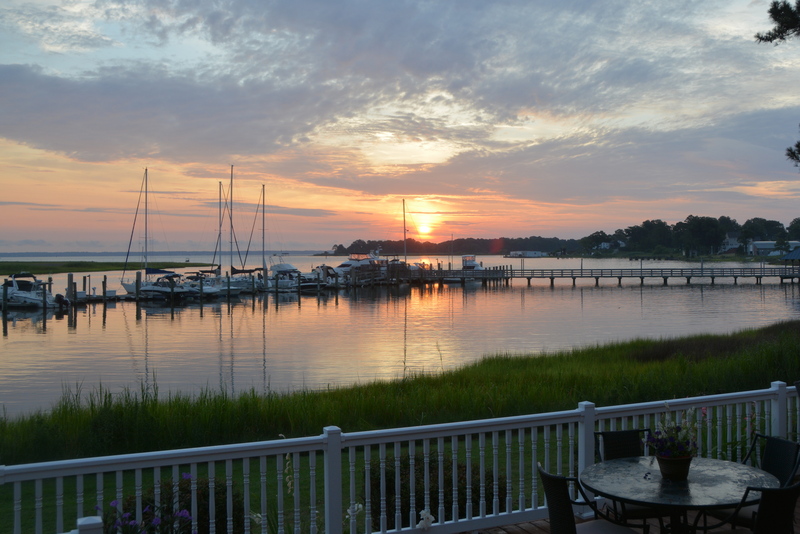 This entry was posted in Days at Home, Family, Racing, Sunrises/Sunsets, The Swans, Traveling Days and tagged beachcombing, coral, family reunion, sea glass, sunrise, white swan moulting. Bookmark the permalink. Praise the Lord for the rain. I’m like you – except that I hear the veggies growing. That means I’m smiling:> Beautiful photos. Thanks! I was hoping you’d get some of that rain. It rained too often over here for beachcombing but I’m glad you had a chance to go. You can almost see the grass growing after that rain! It was a brutal frog choker up here in Richmond complete with tornado warnings. As to the family reunion: two weeks ago we flew up to Maine for my husband’s big family reunion. And it rained like you wouldn’t believe all day long. They put up a big white tent and we all huddled underneath and had the best time. In any case, I’ll keep my fingers crossed for a sunny day for you. Somehow, as I was reading your first words about your family reunion, I KNEW it would end up being a good time. Same thing happened last year – we had a small crowd, but we partied in our garage, and it was cozy! crossed for better reunion weather! Sure hope you have better weather for your reunion. As always, your random 5 Friday was great! I like your random fridays. It reminds me of women’s conversation. It just jumps from one subject to another not worrying about how it all goes together. Getting all the important “stuff” said before you forget it! Yes- another great R5F ! – hoping for good weather for the reunion..! Great sunrise shot, too ! Tell JR his picture is lovely. You taught him well! lol Walking the beach looking for shells is great fun. Less feathers or not the bride swam is a beautiful. Hope the weather is good for your reunion. Beachcombing with a friends sounds like a wonderful way to spend the day. Wonder what’s going on with Bride Swan. I hope she’s molting and it’s nothing serious. If I was there, after Bride Swan went on about her business, I’d pick up those gorgeous feathers and use them in a bouquet or craft or something. I’m glad you all got some much needed rain, but I hope this weekend is clear and sunny for your reunion. Great photos as always and congrats to Motorman for the beautiful sky. We had rain here yesterday too and how I love the sound of it. Good luck with the reunion and the weather. MM is good with that camera. Bride Swan is dropping her flower petals on the way down the aisle. It sounds like a relaxing time you and Bev carved out of the day. I hope you don’t have to deal with so much rain this year–but enough of a cool front to make it comfortable to be outside.